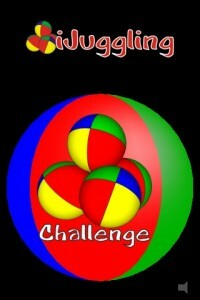 Just downloaded a few juggling related iPhone apps. Kevin Bertman pointed out his recently released iJuggling application in the comments on my last juggling related post. It’s available in the app store now, and I checked it out. My first complaint is that there are no instructions whatsoever. I started playing the game by selecting the “challenge” menu item (the menu was also confusing, but cool once I played with it a bit–all the menu items are placed on one face of a ball with four faces, so you have to rotate it to see all the menu items). Once in the game, 3 balls fell from the top of the screen into two hands awaiting below. Underneath the hands are a couple of circles that I intuitively (and correctly) assumed were to control the hands. Once I’d established more or less how to throw a ball, getting three of them in the air at once was fairly easy. Catching them and keeping them aloft was a bit more difficult, but I still got the hang of it pretty quick. When I made enough throws, an arrow indicating I could move on to the next level became available. I had A LOT more difficulty with the second level, and now I think I know why. Remember those bars above the hands on the setup screen? They indicate how high the balls will get thrown. On the second level, the bars are much lower, making the throws faster with less time between them. How do I know this? Only because I finally navigated to the “Stats” menu item, which shows you your high scores for each level you’ve played. The level itself is indicated by a small graphic representing the setup screen for that level. The bars are lower on the second level than the first. The third level was 5 balls. Definitely a lot harder than the first or second, but I’ll admit that I only played with it for a few minutes before putting it down to write this review. 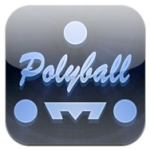 iJuggling looks very slick. The graphics aren’t amazing, but they’re good, and there are some nice touches that indicate to me that there was a lot of thought put into them. The hand grab points fade out once you touch them, for example, and the arrow pointing to the next level fills up as you get close to achieving the next level. There is some sound, indicating when a throw and/or catch has been made. It’s simple, but again, doesn’t detract from the experience. The most frustrating thing was in figuring out how to play, and after that the difficulty. I like a good challenge though, and I will definitely play with this again. One additional note/downer: In iTunes, and on its website iJuggling is billed as the first realistic juggling simulator on the iPhone. While it’s fun, and definitely a juggling game, (a unique one, at that, I think), it definitely wasn’t the first. I thought about also debating whether it’s a simulator, but that’s… well, debatable. 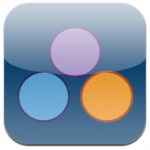 JuggleFit Tracker is a free utility that allows you to track your progress (a number and a date) associated with a juggling pattern. You can then allow it to tweet your progress if you like. There are quite a few arbitrary limitations (it only stores 5 progress rows for each pattern–it would have been much cooler to store them all, and maybe graph them over time, for example). But if you’re interested in tracking your juggling, this might be a good place to start. Another nice feature are the “tips” for beginning jugglers. I imagine those are quite useful. And hell, it’s free, so this is probably worth checking out if you’re a regular juggler. 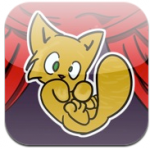 Cat Juggling, while the name and idea are enticing, is not so much a juggling game at all. It’s more one of those games where you have to bounce things in the air. You have two hands to bounce with. So it’s juggling themed. The graphics are really “cute” (I’m sure that’s what they were going for), and I was surprisingly “into” the silly (and repetitive) music track. Also, you get 9 lives, which is funny. There’s not a lot of depth, though it does save some high scores. Probably worth getting for the idea alone, but if you’re not into that, don’t bother. 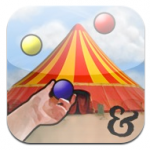 iCircus – the Juggler actually uses a control scheme the closest (of all these apps) to the juggling game I originally intended to create. The unfortunate thing is that it’s way too hard to control. Like iJuggling, the “catch point” is represented by a hand and offset from the “touch point”, or point your finger touches to control the hand. Unlike iJuggling, the touch point is not shown, and this is a much smaller hand, (the graphic also includes an arm, but it’s not clear how much of the arm can be used to catch, so that’s a hindrance rather than useful). 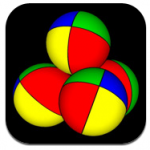 iCircus – the Juggler also adds breakout-style “stars” that you are trying to throw your balls into while “juggling”. This is actually its saving grace, and the only thing that (probably) makes it worth your $.99. As your ball (you start with only one) passes through the stars, they are collected, and when you get them all, the level is complete. The second level adds a second ball of a second color, and stars are only collected by balls of the same color. All in all, this makes for some very interesting possibilities, but I found the game almost unplayable with the existing control scheme. I only got to the third level, and only then because the game appeared to take pity on me and allow me to progress without collecting all the stars for the second level. There were some other apps in the app store that had juggling in their titles, Cannonball Juggling, Juggle Gears, Juggle Pong, GolfBall Juggle, Picsaw Juggle, but none of them were really juggling. (Or they were that other soccer meaning of the word juggle.) This concludes my informal survey of the state of juggling apps in the app store. Enjoy!